Congratulations to misshavs! You’ve won the Hushamok organic baby hammock. Thank you to everyone who entered our contest. Please stay tuned to Inhabitots for future giveaways. Rocking your newborn to sleep is a time-honored tradition, but when arms grow tired, it’s nice to have something nearby to help lull your baby to sleep without so much physical effort. Babies love to be rocked, and although there are plenty of “swing-o-matics” on the market, they are usually garish, battery-powered gadgets, and made of synthetic, toxic materials – a far cry from “relaxing”. So when we reviewed Hushamok’s organic Okoa Hammock, we were delighted to find a baby hammock as beautifully designed as nature itself. Designed to naturally swing in the breeze to rock your baby into slumber, this all-natural swinging chair contains no plastic, dyes, flame retardants, and requires no batteries. The organic cotton swing is suspended from a C-shaped ‘Okoa stand’ made from untreated European beechwood, designed to make your infant feel like they are right back in the womb – and it won’t look bad in your living room either. We’re giving away a brand new hammock set worth $599, and it could be all yours just by entering below. Plus, all Inhabitots readers will receive a special 10% discount on any Hushamok item using promo code Inhabitots15 through TOMORROW, September 30th, 2015! 1. Leave a comment below telling us why you want to win the Hushamok Okoa Hammock, and what you love most about it. Giveaway only open to residents of U.S. and Canada. Designed for both beauty and functionality, the Okoa Hammock fits perfectly within the stand’s moon-like crescent shape. The stand’s solid aluminum die castings coupled with sustainably harvested European beechwood provide a strong hold, so there’s never a need to worry about the stand tipping over. Hushamok’s claim to fame is that babies will fall asleep fast and stay asleep longer – a godsend for new parents. The seat is specifically deigned to reduce nerve strain by supporting your baby’s natural curvature of the spine, while giving her or him that enclosed, womb-like feeling. The winner of this giveaway will receive a hammock set that includes the Okoa stand, hammock, 2 organic cotton sheets, and one mattress with an innovative Leafspring motion. The hammock is thankfully machine washable, and the beechwood Okoa Stand can be easily wiped down with a wet cloth and some linseed or olive oil. The hammock and stand can only be used for babies under 22 pounds. After your child grows out of the baby hammock, be sure to check out the Okoa My Seat, a fabulous indoor/outdoor swinging seat designed especially for big kids. Enter below for your chance to win this coveted baby hammock/bassinet! I would love this for my baby. He has digestive issues (due to being a preemie), and this would help relax him when he's trying to sleep. The design is just amazing! I love that it will help my baby to sleep more comfortably. i would love to win the hushamok organic baby hammock because it's awesome and our baby will love it! I would love to win this for our upcoming baby. This would be perfect to use as it would work perfectly in our space. I also love that as the baby outgrows it it can be changed into a chair! Love that! I love the clean lines and simplicity of this. It's beautiful. Thanks for the chance. What a wonderful design. The Hushamok takes the traditional hammock to a whole new level! This hammock would totally soothe my fussy napper. I love that is the perfect combination of practical + beautiful design + organic. What more can you ask for?! I would love to win this because it is the ultimate baby swing that'll be a wonderful gift for the newest addition. I'd love to win because it seems so dreamy for baby. I'd use this for baby #6. Beautiful! This would be great for our next little one coming in January! Natural movement! What a great product for my newborn. Love the Hushamok values! This would be a wonderful gift for my neighbor who is expecting her first baby. It is both beautiful and functional. We will be having our 4th baby next year. This would look great in our house for the new baby! I love that it's all natural and organic cotton! I'd love to win because we are TTC and this would be perfect for a new baby!! I work for an environmental non-profit organization so I do my best to be as environmentally friendly and sustainable as possible. I'm expecting my first baby and this hammock would be an excellent addition to our green nursery! I have been doing lots of research into eco friendly baby products and I love that this hammock is all natural so I don't have to worry about the baby being around any harsh chemicals. My last 2 babies were refluxy and colicky for the first year of life, my son would only sleep sitting up so we bought a chair hammock so I could get some rest (he was sick every 2 weeks with breathing issues, admitted to hospital many times) now we are trying again, I'd love to win one of these as I'm scared it will happen again and sleep and comfort are my priority. I love this because it's 100% Organic! I also love the unique style of it. I want to win for my nephews that due in October. We will be fostering him. Thanks for the chance! Whats not to love? I love all things 100 percent organic. My wife and I are TTC, this would be great! I am impressed with the fact that you can position it anywhere in the house and it's natural look which will make it safe and comfortable for the baby. My wife and I are expecting our first child in January, this will make baby to be at ease all day long and perfect gift for my baby. I would love this for my niece. She was born a month early and I'm sure her parents would love it. Machine washable is great. Organic cotton will be so soft and comfy. I love that it may help a baby stay asleep longer. I love the rocking that a hammock creates. Looks so soothing for the little ones. Natural and organic cotton is wonderful and I would love this for my grand baby! I would love to win a Hushamok Okoa hammock for my 2 week old baby. What I love most is that it doesn't require batteries and it's made of nontoxic materials. Oh this looks so wonderful!! We are expecting our first child soon and I can just imagine him enjoying this beautiful hammock. It looks so comfortable and inviting and would be a perfect place for our newborn son! This baby hammock would be so sweet for our soon-to-be born baby! Who doesn't love the feeling of swaying gently in a hammock? The design is sweet and modern. Very cool! I would love to win this hammock because I am moving to a new home and my daughter's hammock chair will no longer be able to be used indoors since there is no hook in the ceiling at our new house. She will miss her hammock and this would be a perfect standalone solution. Hammocks are great for kids with high energy, they keep kids from climbing the walls, and from climbing on me! This will be perfect for our little one to sleep next to our bed and be both swaddled and safe. It's also perfect to keep her close by while we do dishes or other housework. I need this for baby #3. We got rid of all our baby stuff and this would be perfect in place of an actual crib with its womb-like feeling and natural curvature. I'm kinda jelly that it's a baby hammock and not a grown up on! Because, com'on, who doesn't like a hammock, especially a Hush amok one?? I would love to win this for a sweet friend and her new baby. The design is beautiful! I am thrilled to see baby furniture that is both functional and beautiful. I would love to win this! I am due with baby girl #2 next month. I know that this would be a better sleep environment for her. Also, it is a great transition to turn it into a child's seat! I would love to win this hushamok for my baby. It's design is so stylish and I love that it's organic and free of plastics! I'd love this for my 2 kids and to use for the next baby too!!! Looks super comfy for newborns!! This hammock would make such a lovely gift. It would be perfect for a mother dealing with a fussy baby, and would go with any decor. I would use this with my baby who only goes to sleep while being rocked. I love the design, too. The design is simple and elegant with a brilliant degree of function. With my wife and I expecting our first born on October 6th, this baby mobile would be a great addition to our little guys sleeping arrangements! I would love one of these to be able to gift to my best friend as she is having her first baby. The design is beautiful and the testimonials reassure met that it really aids in peaceful rest! My granddaughter would love this. She loves the swinging motion, it makes her very happy. My daughter would absolutely love it too. She could put her daughter in there and swing her to sleep. I'd like to win because my husband and I are planning baby #2 for the coming year! Oh this is calling my baby's name! Rock a bye baby.. maybe not on a tree top. I love that it has zero dyes! I want to win it for my new baby cousin who is way sensitive to EVERYTHING. I think it would be wonderful for her not only because it is made so naturally, but also because it moves naturally as well. I had no idea baby hammocks were a thing til I saw the email in my inbox presenting the contest, but I love the design and the portability. 27 weeks pregnant with my first child and don't have much to speak of for her yet. This would be a lovely additionI certainly wouldn't be able to afford otherwise! Counting heavily on the baby shower as it is. I like the desing and that it grows together with the child. I like that it's organic and it looks very comfort too. I hope to win this hushamok for our new babygirl, we expect her soon! I would love to give as a gift first Grandbaby on he way. Love that it is all Natural.. This is so neat! What a great idea! I would love to win this for a friend. Oh goodness, this would be a dream! I love the bentwood frame and the attention to detail throughout the design. We have a baby on the way I just a few short weeks! This is a brilliant idea, great for babies to still feel like they are in the womb and keep them protected! I would love this for my next baby. I'd like to try this for my 3 month old. The contemporary design is unique and I like that it can grow with my little one. . I would love the opportunity to win this hammock for my new baby girl. I do the best I can to minimize the toxins and chemicals my children are exposed to, and I love the materials this hammock is made with. As an added bonus, I love the modern and simple aesthetic! I love the fact that it surrounds your little one with natural and organic materials...it's also quite beautiful. Hope we can add this to our home and enjoy the peaceful environment is might encourage. I would love this product for a friend or myself. Great idea, elegant, sleek, modern, love the materials and transitions, just from a stylistic point of view it's a great conversation piece...maybe you don't even need a kid to own one of these! Our first baby would look very cute in this. She already sleeps very well, thank you! I have been coveting this baby hammock for over 3 years! I would love to have one of my own. Please, Inhabitots! Please make me a winner of this Hushamok hammock! My friends all have babies, and bring them by my house very often. I would love to have this for each person to experience. I would also loan it to each friend for a certain amount of time. This way it gets moved around, seen by everyone, and has a history created through sharing. What a beautifully designed baby hammock! I have never seen a baby product as beautiful as this. Being environmentally safe, this hammock has qualities like no other. Since it will not tip over and is 100% safe guaranteed, it is a must-have product. Also, it looks so comfortable; I wish they made one for adults. As a mother to be, I would be incredibly grateful to receive this product. Thank you for having this wonderful drawing. I would love to win the hammock for our new baby. it is really beautiful, all-natural made with non toxic materials . The hammock looks sturdy, comfortable and i am sure the baby will love it. Our first baby is due in April and this would be a perfect bassinet/crib alternative in our tiny NYC apartment! This is a great product. Beautiful and functional! I'd love to win this baby hammock for my brother and his wife who are expecting their first baby in December. I love that it lulls the baby to sleep and is made with natural and organic materials. It would be so cool to surprise my new niece or nephew! This is an incredible invention. Baby would sleep great. This is so beautiful! I am having my second baby and this would just be functional and useful! I would love to be considered for this giveaway, because the hushamok is a great product that we would love in our nursery. I don't feel any more deserving than every parent participating to win, but I appreciate how the hushamok grows with your little one's needs and how it does become part of your lifestyle, and in a way part of your life. From the perfect bassinet welcoming your little one to a new world, to the hanging chair that your toddlers will enjoy as they grow up as a little fun space to call their own. I remember when I was a kid, the most fun I had was in chairs around the house. Coming from a family of artists, our hobbies are indoors. From coloring, to writing, to reading, to watching movies and letting our imagination free. We spent so much fun and magnificent time on chairs that we cherished and upholster with time, just because those special places became part of great adventures and a very active and creative imagination. So thank you for the opportunity to win such a great, practical, and awesome product. What's not to love about this beautiful, safe, and organic hammock for the newest baby in our family. It's portable and so user friendly...a trip to Grandmother's, a weekend spent visiting relatives, and a bed to place anywhere in a home...Amazing and Awesome. Would love to win. Thanks. I would love to win the Hushamok Okoa Hammock because the value of good rest in the development of my child is very important to me and to future society. Good health and stewardship of resources (organic materials are usually responsibly produced and have a low impact on the environment) from a young age will reduce the environmental, medical cost, and human impact on the environment. Winning this and owning this will come with a great story to tell and be a great family heirloom for years to come. That's gorgeous! I would love to have something so lovely to place my infant in! Interesting design with a sculptural and mechanical poise. A must have for an art lover. Can't wait for the adult version. What a beautiful eco-friendly pleasure for baby!! I would be thrilled to win the hammock to host my baby grandchild that will arrive in the spring! The beautiful, modern & natural design would complement my home perfectly and would be a welcome addition to the mix. The added bonus of comfort and relaxation for the baby makes this the perfect addition to our much anticipated arrival. My baby would be thrilled to have such an amazing bed in which to sleep. We love the way the product grows with the baby to encourage their development and well being through thoughtful and amazing design. My beloved sister-in-law is due in January. She has been a kind, loving, and wonderful wife to my brother. She is a wonderful friend, and a fantastic mom. She has been a mom to my brother's daughter from a previous relationship too. She has always gone above and beyond for our family, and I only wish I could do more for her. I would love to win this hammock. The design is elegant and the baby will love it! My niece is due for her 1st baby on Nov 18th a little girl after 6 years of trying to conceive. The family is thrilled! I know she would Love to have this awesome hammock. I would definitely be a Great aunt if I was able to gift it to her! thank You for the chance!!! My dear friend told me that her newborn baby boy loved being in his hammock and highly recommended that I get one for my baby (due in January!) I would love to try it! My new neighbors have a brand new baby. And I think it would be great to get this for them when they probably have a lot of brand new bills to go with their brand new baby. We are expecting our first any day now. He was actually due on the 4th, so I'm on pins and needles! I love the look of this and we are trying to create a home with good indoor air, so we don't want to fill it with a lot of plastics and foams. We found a used bassinet, but it doesn't look anywhere near as cool as this! Since I sold a lot of my furniture for cash during the recession, we certainly have the space! I have so many friends with newborns. This would be a perfect gift and its so cool that its organic! So important for raising a healthy baby. I LOVE that the Hushamook is organic, non-toxic, and takes up such a small amount of space, visually. We are a military family expecting our first baby -- in an apartment that is less than 700 square feet! We have to carefully edit our things to keep from feeling overwhelmed. The Hushamook would fit in perfectly. I LOVE that the Hushamok is organic, non-toxic, and takes up such a small amount of space, visually. We are a military family expecting our first baby � in an apartment that is less than 700 square feet! We have to carefully edit our things to keep from feeling overwhelmed. The Hushamok would fit in perfectly. It looks dreamy in every way - the form, the function, the fantasy and the reality. It would plainly be additive to any baby space, both figuratively and literally. It's simply exciting! I want to win the Hushamok for my Sister in law. It would really help her out with my nephew. I want to gift something truely awesome to the first love of my life. He and his wife have just had their first baby and this would be perfect. I have the perfect pair who are excitedly awaiting their first: this lovely hammock would be adopted into a wonderful new family of eco-conscious, bike-to-work-on-the-streets-of-Genoa hammock aficionados! It would truly be the best of gifts for the best of people, and stylish to boot. What a wonderful idea! It has all the right references for a sustainable design preserving the baby health and care by the entire family for getting babies to sleep with a unique peaceful solution, low impact, environmentally friendly dies: organic, natural and safe in all over the world. Sweet Dreams are made of this with it's natural swinging and rocking motion. As a design teacher as I am I can say here as well that it strikes the target because Design is e-motion! - Roberto Giordano, architect and designer. Absolutely fabulous design! My first never slept but would always fall asleep in a swing, so this seems just the answer! I can see how the design make baby feel like they are in the womb. How they can feel like they fee like they are in walking in their mom;s stomach. i love the design of it, so beautiful! my nephew is expecting his first baby in february, would love to give him this!! I would love an Okoa Hammock to help my little one get some cozy naps in during the day. What I love about this product is that it looks encredibly comfortable, it is esthetically pleasing and environmentally friendly! We're expecting in mid-February. This would be really helpful. Just beautiful! It's architectural, eco and baby friendly and off all the new fangled baby paraphenalia, it makes the most sense. I'd love to have one for a grandchild. it looks amazing, like the baby is sleeping over a cloud, close to the moon. here waiting for my baby girl who arrives on Earth in december. Thank you for the chance! Love the combination of modern and old-world design and style. The wood stand in particular. We will be grand parents in a couple of mounth's, this HAMMOCK would be the perfect cradle for our first grand child, for we will hopefully have her in house a lot, Helping her parents to continue there work. I love how comfortable it looks and how unique it is. My Wife and I have 5 kids and now approaching the 6th. We have seen many evolution of cradles and rocker but none that will adapt with as the child grows. The Hushamok appear to set itself as a comforter/ binky in cradling the baby as if in the mother�s arms and then transforming to swing or safe place as they grow for nap times or even story time. As a green design it succeeds in re-inventing ways to keep using it. As parent who are well aware of the expenses associated with having kids it a definite savings to have this great innovation that is more than just a crib. Expecting twins in Oct... I believe they wouldn't have anything against it ? it's such a wonderful design, it will rock my baby to sleep, and help him sleep more comfortably! My Daughter is having her second baby any day now and could use all the help she can get keeping her babies happy and rested. I can't think of a better device to help keep her newborn contented and provide big sister with an opportunity to help mom rock the baby to sleep. My husband and I are focused on finding multi-functional, long-lasting items as we look have our first child. This hammock would be a great addition to our nursery plan. as an architect & recent father i would cherish the opportunity for my little girl to experience the beauty of flawless form & function from the very beginning of her life. much love & wonder, fingers crossed from down under. stalk sold separately ? Gorgeous! As an architect I love the balance of the structure and the lovely curved aesthetic. As a NEW Auntie I love how beautifully this would cradle my newborn niece and future nieces and nephews. I have always secretly wanted a baby hammock, so amazing!!! Sorry, I should also add I am due with my first in December! I love that the clean lines of this piece - as someone who lives in a NYC apartment, it's always great when a baby item doesn't make our living room look like a daycare but still fills a baby need (and based on how quickly this kiddo who is due next month goes to sleep when I walk around, a swing is seeming more necessary). That, coupled with the fact that it uses baby safe/ high quality materials and finishes and doesn't require the batteries makes this very appealing! great design and organic too! This would be a great add-on to our collection! It's a wonderful concept, and about time, baby Hammocks! I need this! We have no room and this looks super comfy for our little girl! I'd love to win this hammock because it looks so cozy! I wish I could get one in my size! Untreated beechwood, organic cotton, womb feel, turns into toddler reading nook...what is NOT to absolutely love about this?!?! Baby boy #3 is coming in December and I need a portable place for him to nap whether we are upstairs, down, inside or out. This will be perfect! Then all three boys can enjoy reading in it! Thank you! I would love to win this for a friend...what I love that its all natural.. I want to win this because it encompasses my parenting style perfectly in one beautiful product. I love that it is natural and simple, yet also elegant and stylish. I've steered away from all the plastic, chemical-laden baby "necessitates," in hopes of giving my baby a cleaner more soothing life, and this hammock is just perfection. I would love to win this for my future grandson. He will be born in Dec. My son and DIL thought they were done having children but SURPRISE! Now they have no baby items for the baby. This would be wonderful because I feel that hammocks are comfortable and relaxing for adults I'm sure a baby would be content and happy to be in this wonderful hammock. An added plus is that I love that it's organic. Looks so comfortable I'm not sure I'll let my coming baby sleeping there or I'll change places with him! OH MY GOODNESS! It's just SO beautiful and elegant looking! I would love to gift this to my sister who is expecting her first child! My brother slept in the adult version of this, a jungle hammock when camping. My adult children are having kids and would like this baby hammock. My daughter is having her first baby and I used something like this when she was little. She turned out pretty calm and I want the same for her baby. Ok, for one thing, we want to be ragingly envious of our daughter. But more seriously, our daughter exemplifies something we learned while on vacation in the Yucatan Peninsula; the descendants of the Maya rely on hammocks as their standard bedding and one thing we were delighted with was the idea that everyone could 'rock' the baby just by passing by the hammock and nudging it. A good breeze might as well. Nature and nurture. I want to win because I have a 4 week old grandson and I feel that he would feel safe and nurtured in the Hammock. I would Love how he gets rocked and swing by nature. i would love to win the Hushamok Okoa Hammock because it is a neat product for one, it looks amazing and im sure that it would be perfect for baby to sleep in and nap during the day happily and comfortably while im able to tidy up the house just a bit and *possibly* have a little break that is just for myself(im kidding myself i know) i know that if i am comfortable in a hammock then a baby must love it and feel at ease and completely relaxed. I love hammocks! So I can only imagine a little one loving it too!! I have a friend who is pregnant and would love this! I need this because I have 4 kids and no family in the US. This will help me a ton. I love the design and how it looks so comfy and safe for baby. My daughter would really benefit from this hammock since she has a hard time going to sleep. I love the fact that the entire product is non-toxic and that the hammock fabric is organic! I would love to use this for my little one who can only get to sleep by being rocked. Plus, the design is gorgeous. Having baby #3 in the new year and this would make those long nights that much easier! Super comfy and supportive for the new baby! Looks like a perfect nights sleep for the little one. I can't wait to use this beautiful baby hammock! Love the overall design, especially the not much physical effort part. Great looking piece. Oh this would be so perfect for my new grandbaby on the way! I love the shape and design...so beautiful! I also love the natural swinging and rocking motion!!! This would be one of those items you would pass down from generation to generation! I am a first time grandparent and my daughter is having twin boys !! She is huge and they are alreday active...due Oct. 14th. I would love to give her such an elegant and useful "hammock"...one twin can be rocked to sleep so she can nurse the other or sleep herself ! Swinging and rocking are the way to go !!! But this is so stylish in addition. I would like this because it looks so cool! I would love to win the baby bassinet for baby number 1 arriving in January! We are trying to only buy nontoxic things for our newest member, to keep her as healthy as possible. I love that the hammock contains no artificial dyes, and that it does not take batteries! I think this is so cool how it is very versatile for all ages. My son is 26 years old and expecting his first child in November. It's been a rough year financially for him and his wife and having this Hammock would add such peace, beauty and functionality to creating a good nights sleep for all. it looks so relaxing, every baby has to love this!!! i think baby Aleena would loove this! i think this looks so relaxing, every baby has to love this! I would love to win this for my sweet baby girl! I love that everything about it is natural. Naturally positions the baby in the hammock, naturally organic, and calms baby without all the devices and tricks on the market today, I love that you can take this anywhere with you, as if travelling with a baby isn't hard enough. This will comfort baby and help them to feel safe and at home no matter where we go. I would love to win this for our next baby. I love the idea, simple, and effective. Wish one. I love that this product is all natural and safe for my baby to enjoy. I will be having my first in December and would love to have this hammock. I really appreciate that it doesn't have any harmful fire retardants, a MAJOR plus!!! OMG this is so awesome! thank u for the chance! I would love to win! i have a newborn and this looks so comfy for her... like sleeping on a cloud! I would love to with the Hushamok Hammock/Baby Bassinet for my god-daughter's baby. It would be awesome since she plans to only use natural products with the baby. I would love to win this for our newborn son Lincoln (Link for short, daddy's a big Zelda fan). He is our 4th child and you'd think as veteran parents we'd be prepared, but nope. Last year we bought our first home and had huge garage sales and got rid of everything baby, since of course we were sure we were done having kids. Haha. Well with 3other small children running around we kind of didnt get everything we needed for baby. So winning him a swing like this would be amazing. Thanks for the chance. Hi! I love this design and more importantly that it's organic. It wolud be a very usefull furniture piece for my first baby who is arriving to this world in february 2016. I want to give my baby the best that i can and this hammock would be amazing. I am sooo excited to have my first child and it would help me tremendously i i win this swing hammock. I hope you pick me. I would love one of these because i'm thrilled to become a first-time aunt in a few weeks and plan on spoiling my nephew rotten :) What I love most about the Hushmok is how protected and peaceful the baby seems to be, and I love the idea of my nephew being that comfortaed as well. I love the design and this would be a great item for my first baby due in December! Oh my, I've envisioned something like this in my head! Simple, practical and I just know it would work to soothe baby. What a brilliant system! It looks so relaxing for babe, and it looks safe and perfect for parents to have their hands free for those rare moments. I concur that we need a mommy size hammock next! I would love to win this for the new baby, arriving March 2016. I love that it's all natural, 100% organic cotton. I would love to win this hushamok for my baby coming november. I love that it�s organic! My cousin is expecting baby #2 and this would be an awesome gift for her! i wish this to be in my size so I can drift off to Neverland, could you imagine a babe? so graceful. if only all the paraphernalia were this lovely. Thanks for the opportunity. This looks great, I love how the baby on the photos look so calm and comfortable, I already picture myself having a few minutes to rest while my baby sleeps! I've adored the hushamok ever since I saw one. I love the clean lines, simple yet beautiful design, and the organic untreated surface it provides for baby. My newborn recently arrived and I know this would provide a wonderful sleeping space for him which would allow me more time to spend with his big brother and sister (and perhaps get some cleaning done also). The crescent shape of the hushamok also reminds me of the moon, and since my baby boy was born under a blue moon it seems like a perfect fit! I absolutely love this. What a great idea for infants. This would make a great baby shower gift. I would love to win this for my sister -- she is due next month. I love all the research on baby hammocks and am expecting baby number three! Have always, always wanted one but they're just so darn expensive! i think this would be perfect for our first baby, i would love one of these! great alternative to the traditional bassinet / crib! this would be great for my baby coming in December!! I would love to win this for my daughter. This is her 2nd child, we didn't know about these hammocks till a friend told her. She saw it and fell in love with it. It's perfect, for all those nights when you can't get the little angel to sleep. She had such a hard time with their 1st little one sleeping and I know this will save some sleepless nights for our new addition. This company makes great products, their reviews are outstanding. It's a company I trust to make a sturdy product for a baby. It's great it gives the parents confidence knowing their child is sleeping safe and sound in their hammocks. I love the whole concept of the hammock. I would love this for my niece. She loves hanging around with her daddy, so I think its time she gets her own baby size. Our first babe was quite the fussy one, she could never really settle unless I rocked her or bounced her around. I know this would help the second babe out if they are the same fussiness! Also, I love the design, the look, the natural aspect of it and we are big proponents of organic around here! I love it because it's like an hammok, confortable and soft. I would like to win it because I'm a young doula in Italy and can use it for many babys not only for the ones in the family. i want to win this because it looks so comfy and i think my baby would sleep so well in this , she has problems sleeping and loves to be rocked so i think this would help her sleep better , i love the design its so sleek and modern . This organic baby hammock would be a delight to have for our 5th child(3 under 3), as infants and young children are impacted the most by the toxins in their environment. This hammock would be perfect for quiet nights filled with sleep! I'd love to win this hammock for my two boys. It's beautifully made and would look great in their nursery. I love that the hammock gently rocks baby to sleep. It looks beautiful and I like that natural materials are incorporated into the product. I would love to win this amazing Hushamok organic baby hammock for my son and my future children! It's so amazing it looks very comfortable and I love how it imitates being in the mother's womb no better felling for a baby to fall asleep and stay asleep. I also like that everything is organic and how the wood stand is made out of untreated European Beachwood. what better way to have Mother Nature in your home. I would love to win for my baby boy! It looks super comfy and I love the design! I would love this for my one month old! It is gorgeous and would be so useful!!! The second I saw Hushamok - I knew I needed one of these. My favorite thing about this is how stylish it looks, and how comfy it looks for baby! I would absolutely love one of these. It looks so comfortable. I also love that it is organic so baby wouldn't be around the "standard" chemicals and gross stuff. I LOVE the design! It is lovely to look at, and seems to be perfect for our littlest ones to give them the sleep they need. Thank you for hosting! This is amazing!! What I love most about the hushamock is the natural design. It looks like the bows of a tree ready to rock me (or more likely my baby ?) to sleep. I love the simplicity of the design and think it's a wonderful reminder that parenting doesn't need to be a fussy, gadget filled experience-And that when baby is sleeping...we can relax a little and get some sleep too, knowing that he or she is safe and comfy. My first lived in his swing but it always felt way to mechanical. Would love this more relaxing alternative for my second. The Hushamok organic baby hammock is so amazing and it would help my little nephew get a good nights sleep as he has issue sleeping looks like you could just curl up and fall asleep with this unique design. Oh if I could sleep so soundly....would love to see if my new baby will love it!! The sleek design is modern but classic and will fit so well in our home since we won't have a separate nursery. We struggled with sleep with our first 2, and sold all our gadgets before surprise #3 so it would be great to have one of these! I think this is very stylish and unique. It looks comfortable for a baby too. We are considering a third babe in the near future. I've loved the hushamok but never could afford one - it'd be amazing and so much nicer and more useful than a baby swing! I like that this hammock supports your baby�s natural curvature of the spine, while giving her or him that enclosed, womb-like feeling. This would be such a peaceful place for our baby to sleep when he/she arrives. This is such a wonderful item to have! Babies need all the help they can get adjusting to life outside! this would make our sweet baby on the way so very happy. both of our littles have had severe acid reflux and this would be a dream for sleep! the design is so beautiful, and the comfort it would offer little one... so important! oh im praying BIG time for this! We are trying for number two, and would love to use this for our new little one. I love the design/shape, but the fact that it is organic is the most important to us. I love that Hushamok has come up with an innovative and natural alternative to the traditional crib. I would love to win this and gift it to my brother and his wife! They are expecting a baby in March. This is so beautiful and looks like it would be so comfy for baby! Can the reason be so I can pretend to be my baby sleeping in that amazing, beautiful thing? Who wouldn't want it!? I grew up in the Philippines where babies are rocked to sleep in makeshift hammocks. I wanted one for my firstborn back in 2012 but it just won't meet safety standards here in Canada. Now that I have a 6 month old, having this Hushamok means long uninterrupted sleep for him and freedom for me! I no longer have to lie down next to him each time he sleeps on this state of the art, beautifully designed, ergonomic and organic hammock. Wish I had it with my firstborn too! I have had my eye on the Hushamok Hammock Set even before we got pregnant and now we are expecting our first little one on the leap year of February 29th, 2016!! It would be a dream to be able to have my baby sleep in the absolute best product there is out there! Unfortunately, budget wise, it was definitely a 'dream' for us to own it but I would love to have one! Our family would be more than thankful, including our little baby! (Crossed Finger's - Baby's too!) ? Hushamok is the only thing I want to put my new baby in to sleep! I've been waiting so long for a baby and I've done so much research into products so when my time came is know exactly what I want for baby. I've been trying for a baby with my husband for 29 months before we finally got our positive. Now that my baby is finally on its way I only what the best and the Hushamok baby hammock is the best! I love everything about it! I love that this mimics the mothers womb for creating an environment where the baby feels safe and secure! I would love this for my son, this would be the center piece of his room! I am love that it keeps babies asleep longer and puts them to sleep faster. I would love to win this for my fussy little gal who takes ages to get to sleep! I love the design and that it's made with no harsh chemicals. I'd love to win one for the next little one. I would like to win because our baby is due in 8 weeks and it would be a great place for baby to sleep and rest. I love the elegant design and that it's a natural and safe place for baby to sleep. I would love to have a hushamuck for the child currently growing inside of me. The artistry and simple lines attract me to the hammock. It feels serine and calming even in visual appearance. I've wanted one of these beautiful hammocks for a while! Our first baby had colic and this hammock would have been so beneficial. As we are considering expanding our family, if we were to win this giveaway, that would be a sure sign that we should add to our brood! I think this looks great for babies, how comfortable and soothing! What a unique product! I would love to win this for my best friend due with her 5th in a couple months... then it would come back to us for our next! We share a lot of baby gear between our combined current 6! I love how beautiful this is and that the gentle rocking would be soothing as both of our current littlest ones were very fussy and were difficult to soothe! This would be absolutely wonderful and well loved! I love this. We are having our second and we don't have anything for our newest little guy to sleep in. I got recommended this from our doula who had this for her children and would love the opportunity to have one. This would make the most incredible baby shower gift for my best friend, who is expecting her first baby in January. It looks gorgeous and so peaceful! I love the beautiful and sleek design. Would love to own this very zen peice. Would love a cozy place for our new baby to sleep when it arrives to our cold Canadian winter in February! Would love to win this for my new grandson ! It looks like it would be so cozy for him. Thank you for the chance to win it ! I would really love this product because I love innovation and I would like to start my growing family off with the right tools. As a new military mom surrounded by a lot of first time mom-to-bes, I know we need as much help as we can get! 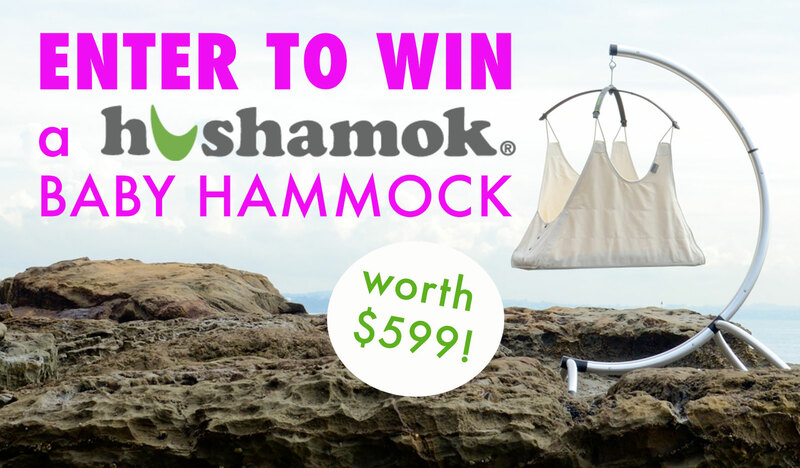 WIN a Hushamok organic baby hammock worth $599! 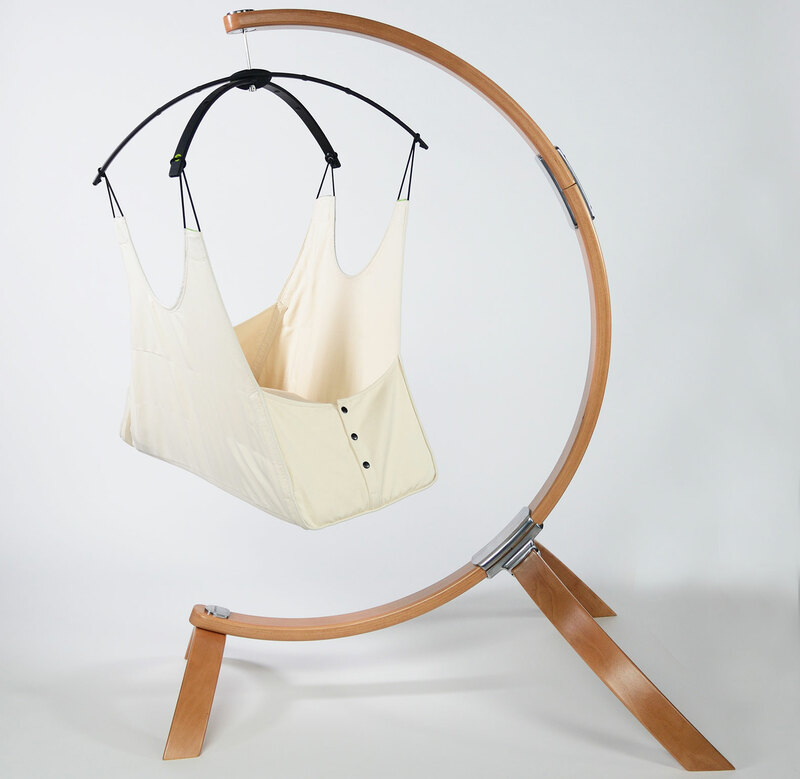 Read on and enter to win a Hushamok organic baby hammock/bassinet worth 599! Rocking your newborn to sleep is a time-honored tradition, but when arms grow tiresome, it's nice to have something nearby to help sway your baby from side to side. Designed to swing your baby peacefully into sleep, this all-natural rocker contains no dyes, no flame retardants, and requires no batteries. The organic cotton swing is suspended from a C-shaped ‘Okoa stand’ made from untreated European beechwood, designed to make your infant feel like they are right back in the womb - and it won't look bad in your living room either. Hushamok's claim to fame is that babies will fall asleep fast and stay asleep longer - a godsend for new parents. Designed for both beauty and functionality, the Okoa Hammock fits perfectly within the stand's moon-like crescent shape. The stand's solid aluminum die castings coupled with sustainably harvested European beechwood provide a strong hold, so there's never a need to worry about the stand tipping over. The stand is made with solid aluminum die castings. The seat is specifically deigned to reduce nerve strain by supporting your baby's natural curvature of the spine, while giving her or him that enclosed, womb-like feeling. The stand is made with sustainably harvested European beechwood. The winner of this giveaway will receive a hammock set that includes the Okoa stand, hammock, 2 organic cotton sheets, and one mattress with an innovative Leafspring motion. After your child grows out of the baby hammock, be sure to check out the Okoa My Seat, a fabulous indoor/outdoor swinging seat designed especially for big kids. The Okoa My Seat is an indoor/outdoor swinging seat designed especially for big kids. The Okoa My Seat, also made by Hushamok.